ASPERA | Australian Screen Production Education & Research Association | From Barbie Video Girl to Smartphones: How portable media devices are shaping new screen production practices. Whereas once video production may have been perceived as a specialised field limited to industry professionals, the advent of relatively inexpensive and accessible video capture devices, editing software and social media applications presents opportunities for a wide range of individuals to engage in the making and sharing of digital video content in screen-based media environments. Video has become an important mode of everyday communications and self-expression, and portable digital media devices such as smartphones, with an array of media production tools and applications (apps), are ideally placed to provide individuals with greater levels of digital literacy and agency in a growing ‘screen production’ culture. These portable digital media devices may be viewed as part of a convergence culture (Jenkins, 2009a) whereby individuals engage in the production of user-generated media content that can be disseminated across communications networks via social media applications (Vine, Instagram, Facebook), posted to online platforms (Vimeo, Youtube) or screened in one of the growing number of international mobile film festivals. So, does using portable digital media devices to produce digital video content require a change in our thinking? How might these emergent digital technologies influence video production practices? In this paper I suggest that filmmakers and creative practitioners look beyond the perceived technical limitations of GoPros, smartphones and tablet computers, and instead focus on ways that portable digital media devices might instigate innovative production strategies, new creative processes and experimental media forms. In order to highlight some of the perceived changes in digital video production practices, I draw upon a selection of amateur and professional video works, including a video I produced, to illustrate some of the ways that portable digital media devices are influencing and/or shaping emergent digital video production practices. It’s a rainy day and seven-year-old Jessica and her five-year-old brother Peter are sitting in their lounge room watching television. Jessica’s attention suddenly shifts when she notices that her pet kitten Cocoa has crept inside one of her abandoned slippers, the kitten’s protruding fluffy tail giving away its location. Excited at the discovery, Jessica leaps up from the couch and races out of the room laughing, she soon returns with her Barbie Video Girl doll. She points the doll in the direction of the kitten, carefully frames the action then uses the doll’s built-in video camera to capture the moment. She taps Peter on the shoulder and points to the video now playing on the LCD screen located in the back of the doll. They both squeal with delight as they replay the moment over and over again. Later that night, Jessica transfers the video footage from the Barbie doll to the family computer and uses the dedicated Barbie Video Girl editing software to add music and graphics to her video. Jessica replays the video a few times, and once happy with the result, the completed cat video is, with the help of her mother, uploaded to her mother’s Facebook page so that others can enjoy the moment. It’s not long before relatives and friends start posting comments and uploading videos of their own pets captured on smartphones, tablet computers and other portable media devices. Some friends post links to cat videos on YouTube, which results in Jessica, Peter and their mother watching countless home-made cat videos made by people from around the world. Jessica and Peter enjoy watching cat videos on YouTube, and increasingly the family will gather around the home computer to view user-generated video content instead of turning on the television. Most of the videos the family watch online are user-generated content, i.e. non-branded media content made by so-called amateurs. But Jessica’s family isn’t the only one producing, sharing and watching amateur videos on the internet, it is part of a growing screen production culture whereby amateurs and professionals are engaging in the production and distribution of video content using a wide range of portable digital media devices, social media apps and dedicated online platforms. From Barbie dolls capable of recording video, through to GoPros, tablet computers and smartphones with cameras, both professionals and non-professionals are using portable digital media devices to make videos for a wide variety of purposes and audiences. Portable media with video cameras are arguably changing our understanding of, and relationship with, video and technology while instigating new approaches to the production and viewing of digital video content. Video has become an important mode of everyday communication and self-expression and portable digital media devices such as smartphones, with an array of media production and post-production applications (apps), are ideally placed to provide individuals with greater levels of agency in a growing ‘screen production’ culture. As media technologies advance and continue to converge with other media, we see the emergence of new media forms that remediate older technologies. Viewing practices evolve as audiences access video outside of the traditional broadcast models of film and television in favour of video on demand (VOD) services, dedicated online video channels and social media. Just as the SMS (text message) on mobile phones was touted as a feature that transformed our relationship with communication, I suggest that video may be understood as the new ‘killer app’. Access to low-cost portable digital video capture devices, combined with increased opportunities for the publication of professional and non-professional videos, is fast ushering in a paradigm shift whereby digital video may be understood as a dominant mode of communication and creative expression. As digital video cameras become more pervasive, it is important to consider what media skills and literacies are necessary to operate in a digital media environment, and how emergent video capture technologies, such as GoPro cameras, smartphones or tablet computers, might shape future production practices and the viewing of digital video content in a screen-based environment. In this paper I suggest that creative practitioners look beyond the perceived technical limitations of portable media devices and instead focus on ways that these tools might complement professional production practices and/or instigate new production strategies. To illustrate these points, I will draw on a variety of video works (both amateur and professional), including a short video I produced. In addition, I will examine some of the ways in which networked media, and the portable screens used to access digital video content, are promoting changes in viewer patterns and facilitating new modes of audience engagement with video content. Technological shifts have become a constant part of our everyday lives as we learn to navigate and negotiate the techno-flux of the new media scape. But in order to be better placed to take advantage of the opportunities presented by such portable digital media devices and online platforms, it is essential that individuals develop new modes of visuality and new forms of digital literacy. Therefore in the future an increased knowledge of new media theory, and in particular the practices associated with the production of digital media content, may be regarded as being important as the ‘three Rs’ (reading ’riting, and ’rithmetic) were to traditional models of literacy. As noted by Lin et al., ‘with the emerging new media technologies in the beginning of 21st century, traditional literacy is no longer sufficient for an individual to competently survive in this new media ecology’ (Lin et al. 2013, 161). The key drivers of this ‘new media ecology’ may be understood as a combination of technological and social factors, whereby technological developments inform social practices and vice versa. As we learn to master new media technologies, we also repurpose and refashion conventional media forms to exploit the potential of these technologies. From dedicated online platforms such as YouTube and Vimeo, through to social media applications for smartphones (Vine, Instagram, Facebook, Twitter), video has emerged as a popular and effective mode of communication, creative expression and entertainment. Whereas once video production, like film production, may have been perceived as a specialised field limited to industry professionals, the advent of relatively inexpensive and accessible video capture devices and editing software has provided many individuals without formal media training with an opportunity to engage in the making and sharing of a wide variety of digital video content. Henry Jenkins observes ‘As average people develop the ability to tell their stories, we’re seeing different perspectives emerge. We’re seeing different groups gain representation, we’re seeing groups challenge the dominant media images that have been constructed for their lives’ (Jenkins 2009a). New media technologies are not only providing greater access to digital media tools and changing the types of stories we tell, they are also, according to Jenkins (2009b, xi), promoting a participatory culture ‘with relatively low barriers to artistic expression and civic engagement, strong support for creating and sharing creations, and some type of informal mentorship” whereby experienced participants pass along knowledge to novices’. This ‘participatory culture’ can be evidenced in the scores of videos uploaded to online platforms such as youtube.com and shared across social media, or the plethora of DIY video production tutorials that help so-called ‘amateur’ video makers to learn basic, through to advanced, video production skills. A proliferation of portable digital media devices designed to capture, view and/or share video content is also facilitating an increased engagement in the production of user generated video content. Portable digital media devices are an integral part of what Jenkins (2009a) refers to as a ‘convergence culture’ whereby individuals engage in the production of user-generated media content that can be disseminated across communications networks via social media applications (Vine, Instagram, Facebook, Twitter), posted to dedicated online video platforms (Vimeo, YouTube). Portable digital media devices also provide opportunities for users to exploit the potential of a wide range of online video platforms and social media applications for screening digital video content; thus bypassing the gatekeepers of traditional broadcast models (film and television) and establishing new broadcast models. Portable digital media devices and dedicated online video platforms and social media are not only shaping new video production and broadcast practices, they are also changing viewer practices by presenting audiences with greater flexibility over when, where and how they engage with video content. A recent Screen Australia report on the impact of Video on Demand (VOD) services on Australian viewing habits found that ‘50 per cent of Australian internet users watch movies and television content online’ (Screen Australia 2014, 2). The report also notes that the YouTube video platform is increasing in popularity, particularly amongst children, teens and young adults, with over 23 per cent of Australians connected to the internet using the service to view both legally and illegally uploaded content in the form of short programs made for YouTube channels, snippets, full-length television, movie content and homemade cat videos. But perhaps the most interesting trend to emerge from the Screen Australia report is more solo viewing on the multiplication of screens (mobile, tablets, PCs, etc.) now available in the average household and thus an increased desire for more choice in regard to the content, time, place and method of viewing video based entertainment (Screen Australia 2014, 2). One need only travel on public transport or walk down a city street to witness people watching media content on portable digital media devices. The television screen has been emancipated from its static position in the lounge room and can now fit within the palm of a hand. Our portable screens in the form of smartphones, tablet computers and laptops, etc., can now be easily carried in our pocket or a bag, thus providing us with an opportunity to transform networked places into entertainment spaces where we can readily watch a variety of online video content. The fast-paced development of networked and digital media technologies is constantly reconfiguring our relationship with media. A greater access to relatively inexpensive media production tools and editing software has promoted a significant shift towards an increasing social engagement in media making practices. Whereas so-called ‘amateur’ video producers have often been associated with the production of ‘low-quality’ vernacular videos, such as the many pet videos that populate the internet and social media, a proliferation of cheap portable digital media devices capable of capturing high definition (HD) video is transforming our understanding of video production practices. As ‘amateur’ video makers exploit the potential of portable digital media tools and learn the craft of filmmaking via a host of YouTube video tutorials and other online resources, it would appear that the distinction between amateur and professional has dramatically blurred. Whereas once, video content may have been largely measured in terms of ‘technical quality’, in an ever-changing digital media environment, it now seems more appropriate to speak of ‘qualities’. In a world of multiple modes of video capture, dissemination and publication portals, one size does not fit all, and video content arguably needs to be tailored in order to fit within the unique parameters of countless video platforms and social media apps that each have their own aesthetics, production characteristics and technical constraints. In the case of social media sites such as Vine (https://vine.co), Instagram (https://instagram.com) and Twitter (https://twittercommunity.com), users are required to think outside the conventions of the feature film as they upload and share amateur video in the form of short video content (SVC). Currently users must work within the unique parameters of the social media platforms, with Vine being restricted to six second videos, Instagram 15 second videos and Twitter 30 second videos. But rather than deter users, the restrictions presented by social media on the length of uploaded videos, which is constantly changing, also drives innovation as video producers consider new production and narrative strategies to fit the constraints of these sites. As cinema and television give way to a host of portable screens, we see the emergence of new media broadcast platforms, which arguably require new production strategies. Bruns points to the emergence of a new media type of media producer, noting that internet and new media technologies that promote greater participation in ‘information access, knowledge exchange and content production’ (Bruns 2006, 275) play an important role in changing traditional models of media production and consumption. In coining of the term ‘produsage’ Bruns identifies a class of users who are more engaged in exploiting the potential and collaborative nature of new media technologies to further improve and extend traditional modes of content production and delivery. Bruns further suggests ‘the core object of produsage is to involve users as producers, and these user-produsers often take the lead in the development of new content and ideas’ (2006, 277). Bruns also refers to collaborative ‘multi-user spaces’ such as Wikipedia and citizen journalism blogs as key examples of produsage in action. Terms such as ‘produsage’ (Bruns, 2006) and Toffler’s (1971) ‘prosumer’ (a new breed of consumer who desires greater levels of control and customisation over media technology) provide insights into the ways in which we are shaping, and being shaped by, new media technologies. But in a constantly evolving networked digital media environment proliferated with a multiplicity of digital media devices, these terms perhaps only preface, rather than encompass the intentions and desires of the many agile media producers making video content of various qualities, for different audiences across a variety of screen-based devices. As media technology shifts, and different video production practices and modes of visual expression emerge, comparing user-generated content and low-budget video productions against big-budget professional video productions fails to acknowledge the role that these visual forms play within a dynamic and multi-faceted new media environment that is arguably more driven by a culture of participation and creative expression, rather than a desire for high production values. As more portable digital media devices capable of capturing video enter the market it’s worth considering how these new media technologies might disrupt or extend video making practices and challenge the traditional binaries of amateur and professional video production practices. The tiny GoPro high-definition video camera is a prime example of a relatively low-cost video technology that is reconfiguring video production practices. Due to their small size, Go-Pro video cameras offer users a great deal of flexibility. Like smartphones, the GoPro camera can team with a plethora of branded wearable and mountable accessories, so it is well equipped to capture video in a wide variety of places and situations, while extending the potential for creative experimentation. Available are such add-ons as under-water housings, flexible mono-pods with suction cups and wrist or helmet mounts. A quick search of the internet will illustrate that the GoPro has been attached to surfboards, cars, bicycles, mountain climbers, skydivers and even drones, as amateur video producers search for innovative ways to frame, compose and capture video content. GoPro CEO Nick Woodman notes that ‘Millions of people around the world capture and share really interesting life experiences, and the result is really interesting content; that becomes a difficult thing for anybody to compete with’ (Trew, 2014). Although GoPro cameras may present users with the opportunity to produce diverse vernacular or short video content based on personal experiences, the potential of GoPro cameras is perhaps yet to be fully utilised by both amateur and professional video producers. Filmmaker Adam Bhala Lough (2014) who used a GoPro to make a documentary on skateboarding suggests that even though the use of GoPro cameras has been popular in the production of reality television and action sports markets, the independent filmmaking community has completely ignored the GoPro camera. Whereas capturing aerial, motion and underwater shots may have previously been limited to professional film crews with specialised equipment, Bhala Lough proposes that GoPro cameras can be used by makers of low-budget videos to extend the creative possibilities and visual language of their video productions. ‘Helicopter shots, slow motion car mounts, under water scenes: you can shoot all of these by yourself and effectively raise your production value. It’s an indie filmmaker’s dream (Bhala Lough, 2014). The cost-effectiveness and creative potential of using the GoPro camera is not restricted to low-budget video producers, as is evidenced by director Scotty Waugh who used a large number of the GoPro cameras to capture many of the action scenes in the Hollywood feature film Fast and Furious 7: The Need for Speed (2014). The ‘Fast and Furious’ movie franchise has arguably been popularised through its heavy use of stunts and fast paced car chase sequences. Waugh proposes that the GoPro Hero 3 camera, with its size and portability, is easy to attach to moving vehicles and is therefore well placed to ‘deliver camera angles that you have never experienced before in a theater’ (Hurlbut 2014). With over 3.8 million GoPro cameras sold in 2013, up from sales of 2.3 million in 2012 (Chang and O’Brien 2014), such sales numbers indicate a high level of market penetration. As viewers become more accustomed to the use of GoPros in mainstream cinema, it’s worth considering how portable digital media devices may be reconfiguring traditional approaches to both film and video production and bridging the gap between amateur and professional fields. Smartphones (also known as cameraphones) and iPads (tablets) are also emerging as important tools to aid the production of digital video content. The introduction of smartphone technology, and in particular the release of the Apple iPhone in 2007, marks an important technological and social shift whereby smartphones present a credible alternative to consumer-end digital video cameras. Ongoing developments in mobile technology have resulted in significant improvements in cameraphones. No longer bound by the constraints that dogged early models (such as poor lens and/or image quality and limited memory capacity) smartphones now offer users touchscreens and vastly improved cameras with high-resolution image sensors. Whereas once video shot on a cameraphone had been quickly dismissed as poor quality and associated with grainy soft focus and green colour-casts, recent smartphone models make it possible to capture high-definition video in a wide range of lighting conditions and locations. Another important factor in making the smartphone attractive to users has come about via a shift to the 3G and subsequent 4G networks. Whereas earlier model cameraphones had been constrained by the limited capabilities of the 2G network, the newer networks now make it possible for cameraphone manufacturers and users to take advantage of location-based services and high-speed mobile communication networks, thus making it easier to engage in both digital video capture and video sharing practices. According to Keep and Berry ‘cameraphones offer film-makers opportunities to experiment with new media forms that acknowledge or remediate earlier modes of film-making, thus generating new forms of cinematic practice’ (2013, 176). Max Schleser a senior lecturer in digital media at Massey University, New Zealand, was an early adopter of mobile media. In 2006 he used a two megapixel cameraphone on location in Japan to shoot ‘Max with a Ketai’, recognized as one of the first feature films made with a cameraphone. For Schleser (2014), the decision to use a cameraphone was centred on exploring new approaches to filmmaking and challenging the popular notion that cameraphones were only suitable for still photography. Arguably a product of the technical constraints of the time, Schleser’s mobile film signifies the beginning of a new cinematic discourse and the cameraphone’s shift from communication device to a video production tool. The aesthetic of Schleser’s film, shaped by the technical parameters of a cameraphone technology in its infancy, also illustrates what Keep (2014) refers to as the ‘liquid aesthetic’ of mobile media, a term used to describe how constant and rapid advances in cameraphone their technology shape the visual practices and aesthetics of content captured with cameraphones (Keep, 2014). In order to take advantage of a perceived growing interest in smartphone video productions, it is now possible to purchase video production accessories (see Figures 1 and 2) similar to those used in professional video productions. From a lens kit, lighting, tripod, shotgun microphone through to a slider and dolly, a wide range of accessories can be used to bypass the technical constraints, and therefore extend the creative potential, of smartphones. 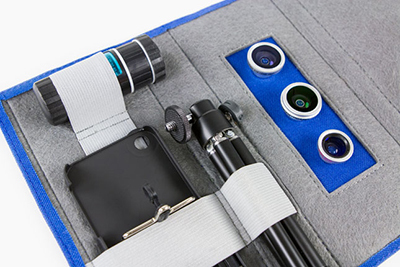 Figure 1: Smartphone lenses and tripod kit. 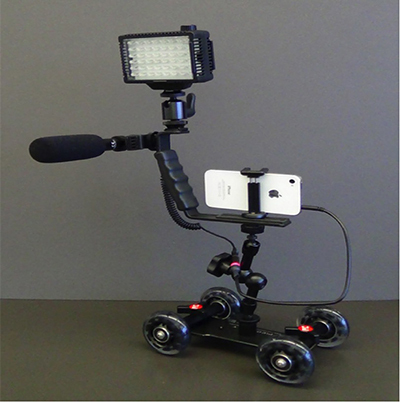 Figure 2: Smartphone dolly with external microphone and lighting. Post-production apps, such as iMovie, Videograde and Cinefy, may also be downloaded directly to the smartphone to aid in the editing, colour grading and creation of special effects for video projects, transforming the smartphone into a pocket-sized digital video production studio. ‘As a media practice, mobile film-making opens up alternative means of film production and viewing, thus creating new modes of cinematic discourse. The cameraphone arguably presents us with opportunities to liberate ourselves from the constraints and pre-occupations with traditional cinema’ (2013, 126). An example of this break with traditional cinema can be found in Olive (2011) directed by Hooman Khalili, a feature film shot entirely on a smartphone. Khalili exploited the unique qualities (portability and size) of the smartphone to explore new approaches to video capture, such as attaching a cameraphone to a remote-control plane to achieve aerial or motion shots. Although Khalili used the smartphone to capture video, the device was used in conjunction with a range of professional video camera lenses, thus mixing conventional and experimental video production techniques and strategies to create a hybrid approach to film-making. Another example of innovative smartphone video production is Sean Baker’s 87 minute feature Tangerine (2015) screened at the prestigious Sundance Film Festival (USA) in 2015. As noted by Newton (2015) Tangerine was shot in widescreen on an iPhone 5S. Baker’s team used a combination of a dedicated smartphone lens attachments and the FiLMiC Pro video capture app to achieve a 2:35:1 aspect ratio, arguably adding a more ‘cinematic’ look and feel to the video. The acceptance of Baker’s film at the Sundance Film Festival demonstrates to video producers that video content shot on portable digital media devices can travel beyond online video channels or social media, and find a place in more traditional film forums, as well as the mobile film festival circuit. Many smartphones and tablets also include video editing software, or users may choose to download one of the many inexpensive video apps from the internet, thus transforming the devices into portable media studios whereby users can capture, edit and export videos for viewing on a plethora of online spaces, portable screens or traditional cinema-based film-festivals. It was a rainy Sunday afternoon. I was sitting in the lounge room with a cup of tea, trying to come up with an idea for a smartphone film. I looked out my window, the grey clouds hung heavy in the sky giving the scene a monochromatic appearance. I was reminded of a time a few years back when I took a train trip to Ballarat, a satellite city about an hour from Melbourne. I recalled boarding the train and taking a window seat. As I looked through the train window, I watched the moving images drifting by as if on a timeline in an editing suite. I still remember taking my smartphone from my pocket, scrolling through the menu to turn on the video camera and then holding smartphone against the window. As I narrowed my gaze to within the parameters of the smartphone screen, I was mesmerised by the way the landscape seemed to undulate, and how the distances, both near and far, appeared compressed. After 10 minutes passed I stopped watching the vision on my smartphone but continued to hold the smartphone to the train window, recording video as I read a book with my free hand. As I looked away from the window and returned to my tea, which had now gone cold, I became aware that my train trip to Ballarat had softened into a memory. I grabbed my smartphone from the coffee table, and after a few minutes I discovered that the videos of my train journey were still stored in the heart of the device. I had found my idea and set myself the task of making a short smartphone video in a single afternoon with the single constraint of using the smartphone as a production and post-production tool. 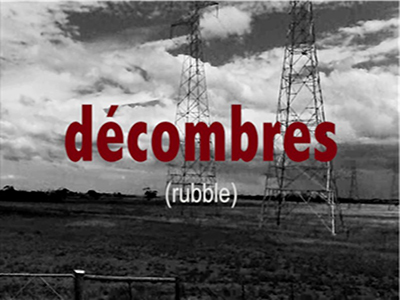 Decombres (2014) is my short smartphone video about a train trip. The title, the French word for rubble, aims to acknowledge the bricolage techniques and remix strategies used as a production methodology. Working only with digital artefacts stored on my smartphone, video footage from a long forgotten train trip is combined with text messages from conversations with a friend over the past ten years. Within minutes I had the body of my film after I carried out a simple edit to reduce the footage down to around three minutes. I then made a random selection of English language text messages and listed them on a blank page using the ‘Pages’ word processing app on my iPhone. Voila, within a few minutes I had a bricolage poem, which was then messaged to a friend with a request for an English to French text translation and voiceover. Within an hour, my friend Alison had translated the text messages into French and sent them back to me using the message app on her iPhone. Moments later a series of messages arrived, each containing single lines of the French language voice-over Alison had recorded using the audio capture function on her iPhone. The French translation of the text messages was used to correctly match the French language voice-over with the English language subtitles. Both subtitles and voice-over were quickly dropped into place on the timeline using a digital video editing application. A quick Google search of ‘royalty free ambient music’ soon resulted in a suitable choice; the music track was added to the video project, then titles and credits. The video edit was refined, compressed and then uploaded to the video channel Vimeo (Vimeo.com) where it could potentially be viewed by an international audience. The process of making Decombres took less than three hours. The technologies used in the video production made it possible to contain the tasks to a small number of devices while exploiting the networked capabilities of smartphones to aid the timely sharing of communications and data across the network. This video may never be screened at a multiplex cinema, or even make it to the Sundance Film Festival, but it is arguably an example of how portable digital media devices can promote a participation in screen-based media cultures and facilitate innovative and collaborative video production practices. As digital video continues to penetrate our everyday spaces we are witnessing a dramatic shift in both video production practices and the ways in which video is published, shared and screened in a new media ecology. With their unique specifications portable digital media devices (smartphones, tablets, GoPros, etc.) facilitate new modes of video production and provide users with a relatively inexpensive means to engage with new media technologies and to participate in digital video production practices. A convergence of amateur and professional digital media production practices is taking place as more individuals participate in a growing participatory screen-based media culture where media skills and knowledge are increasingly made freely available. New media technologies and portable digital media devices arguably play a part in demystifying and simplifying video production processes and present makers of ‘amateur’ video (User Generated Content) with opportunities to reach audiences beyond traditional broadcast models. From Barbie Video Girl to smartphones, portable digital media devices are changing our relationship with video and are presenting users with new avenues for self-expression and communication and, in doing so, play an important role promoting greater levels of agency in a constantly changing networked mediascape. Bhala Lough, Adam. 2014. “Why Independent Filmmakers Should Embrace GoPro (and Vice Versa)”. Filmmaker Magazine, October 16. Accessed April 21 2015. Chang, Andrea and Chris O’Brien. 2014. “GoPro is gearing up to share more of its users videos”. Los Angeles Times (online edition), September 30. Accessed May 8 2015. Jenkins, Henry. 2009b. Confronting the Challenges of Participatory Culture – Media Education for the 21st Century. MA: The MIT Press. Keep, Dean and Marsha Berry. 2013. “Remediating Vertov: Man with a movie camera phone”. Ubiquity: the Journal of Pervasive Media, 2(1-2), 164-17. Schleser, Max, Gavin Wilson and Dean Keep. 2013. “Small screen and big screen: mobile film-making in Australasia”. Ubiquity: the Journal of Pervasive Media, 2(1-2),118-131. Toffler, Alvin. 1971. Future Shock. London: Pan. Trew, James. 2014. “GoPros IPO isn’t about selling cameras, it’s about creating a media empire”. Engadget, February 14. Accessed May 3 2015. http://www.engadget.com/2014/02/14/gopro-media-empire/.